Was physics really violated by EM drive in 'leaked' NASA paper? Ever since NASA announced that they had created a prototype of the controversial Radio Frequency Resonant Cavity Thruster (aka. the EM Drive), any and all reported results have been the subject of controversy. And with most of the announcements taking the form of "leaks" and rumors, all reported developments have been naturally treated with skepticism. And yet, the reports keep coming. The latest alleged results come from the Eagleworks Laboratories at the Johnson Space Center, where a "leaked" report revealed that the controversial drive is capable of generating thrust in a vacuum. Much like the critical peer-review process, whether or not the engine can pass muster in space has been a lingering issue for some time. Given the advantages of the EM Drive, it is understandable that people want to see it work. Theoretically, these include the ability to generate enough thrust to fly to the Moon in just four hours, to Mars in 70 days, and to Pluto in 18 months, and the ability to do it all without the need for propellant. Unfortunately, the drive system is based on principles that violate the Conservation of Momentum law. This law states that within a system, the amount of momentum remains constant and is neither created nor destroyed, but only changes through the action of forces. Since the EM Drive involves electromagnetic microwave cavities converting electrical energy directly into thrust, it has no reaction mass. It is therefore "impossible", as far as conventional physics go. The report, titled "Measurement of Impulsive Thrust from a Closed Radio Frequency Cavity in Vacuum", was apparently leaked in early November. It's lead author is predictably Harold White, the Advanced Propulsion Team Lead for the NASA Engineering Directorate and the Principal Investigator for NASA's Eagleworks lab. "It is shown here that a dialectically loaded tapered RF test article excited in the TM212 mode at 1,937 MHz is capable of consistently generating force at a thrust level of 1.2 ± 0.1 mN/kW with the force directed to the narrow end under vacuum conditions." "The current state of the art thrust to power for a Hall thruster is on the order of 60 mN/kW. This is an order of magnitude higher than the test article evaluated during the course of this vacuum campaign… The 1.2 mN/kW performance parameter is two orders of magnitude higher than other forms of 'zero propellant' propulsion such as light sails, laser propulsion and photon rockets having thrust to power levels in the 3.33-6.67 [micronewton]/kW (or 0.0033 – 0.0067 mN/kW) range." Currently, ion engines are considered the most fuel-efficient form of propulsion. However, they are notoriously slow compared to conventional, solid-propellant thrusters. To offer some perspective, the ESA's Dawn mission relied on a xenon-ion engine that had a thrust to power generation of 90 millinewtons per kilowatt. Using this technology, it took the probe almost four years to travel from Earth to the asteroid Vesta. The concept of direct-energy (aka. laser sails), by contrast, requires very little thrust since it involves wafer-sized craft – tiny probes which weight about a gram and carry all their instruments they need in the form of chips. This concept is currently being explored for the sake of making the journey to neighboring planets and star systems within our own lifetimes. Two good examples are the NASA-funded DEEP-IN interstellar concept that is being developed at UCSB, which attempts to use lasers to power a craft up to 0.25 the speed of light. Meanwhile, Project Starshot (part of Breakthrough Initiatives) is developing a craft which they claim will reach speeds of 20% the speed of light, and thus be able to make the trip to Alpha Centauri in 20 years. Compared to these proposals, the EM Drive can still boast the fact that it does not require any propellant or an external power source. But based on these test results, the amount of power that would be needed to generate a significant amount of thrust would make it impractical. However, one should keep in mind that this low power test was designed to see if any thrust detected could be attributed to anomalies (none of which were detected). The report also acknowledges that further testing will be necessary to rule out other possible causes, such as center of gravity (CG) shifts and thermal expansion. And if outside causes can again be ruled out, future tests will no doubt attempt to maximize performance to see just how much thrust the EM Drive is capable of generating. But of course, this is all assuming that the "leaked" paper is genuine. Until NASA can confirm that these results are indeed real, the EM Drive will be stuck in controversy limbo. 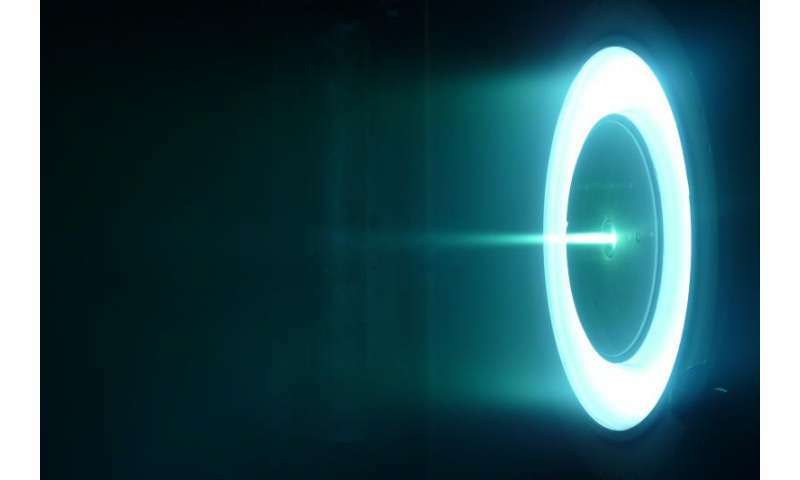 Why the discussion of space thrusters? If this is true it has major implications for the whole of theoretical physics. Speculations about performance in space are trivial.